The death of a loved one can be tragic. Many people look to the Last Will and Testament (“will”) of a loved one for written expression of their wishes. But what happens if another relative has the will and refuses to offer the Will for probate? Here are three options that may help. A family member’s “safekeeping” of a deceased loved one’s will may not result from bad intentions. They may just not understand the importance of the will. Many people assume that when a person passes away with a will, there is no need for probate. If concerns arise regarding the whereabouts of a will, asking family members nicely or seeking the help of legal counsel may be just what you need to retrieve the document. 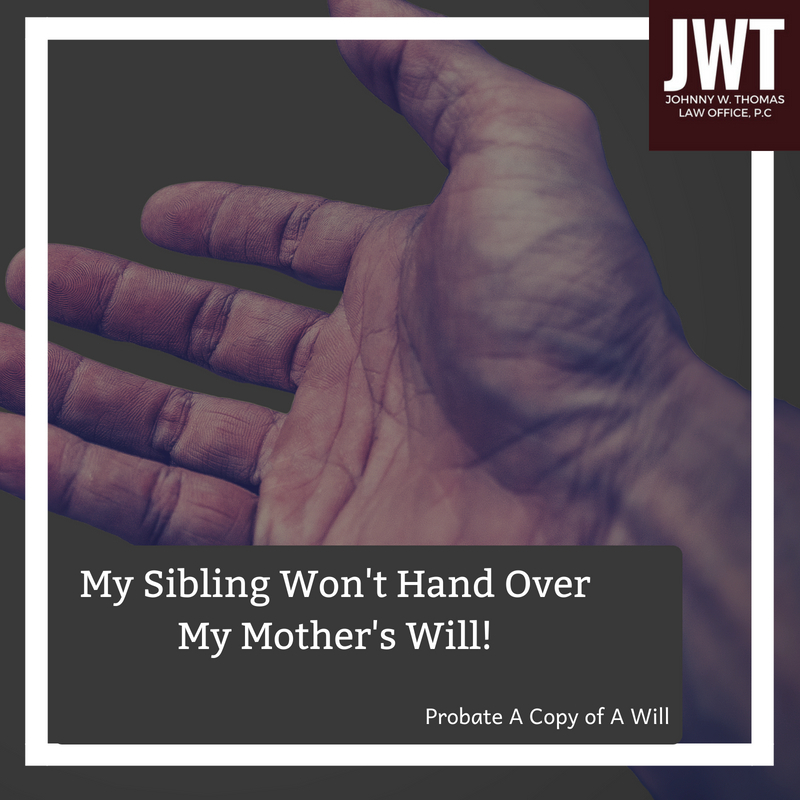 If the family member holding the will refuses to present the will after you have asked nicely, Texas law provides the opportunity for an interested party to file a Motion to Compel and Show Cause. This motion allows interested persons, with the support of the Court, to demand the will be provided for probate. Persons who ignore this motion for show cause may face penalties of the Court. If the ORIGINAL will is nowhere to be found, proof can be presented in court for a will that cannot be produced in court. This additional proof may require the testimony of credible persons who have read the original will or a copy, or by a credible person who can identify a copy of the will. The Court will also require sufficient evidence to why the original will cannot be presented in court. If you find yourself in a situation where a family member will not hand over a will for probate, a competent probate attorney can help you navigate your options.